A compassionate workplace is happy, productive and successful. And yes, compassion can be learnt. This training can give your teams and organization to excel at the human and business fronts. Re-engineer your work culture, productivity and customer service with this unique process. Hackathons, Retreats and Multi-Week training. The possibilities are endless. Every solution is uniquely yours and co-created by You. We teach your people to conduct hackathons for others in your organization. We help you navigate the logistics of organizing compassion events across large distributed organizations with this unique opportunity. Once we train your internal trainers, we give them the digital content, the technology access and more to become the agents of cultural transformation in your organization. How do we scale up our training programs to diverse, distributed and large organizations? We create ‘compassion moai’s’ within organizations and ‘compassion ambassadors’ to lead the moais. Moais are Social Support Groups in Blue Zone Okinawa. Compassion Moais create and sustain cultural nodes throughout the organization. Compassion ambassadors get training, digital content, technology access and our continuing support to change their work culture. 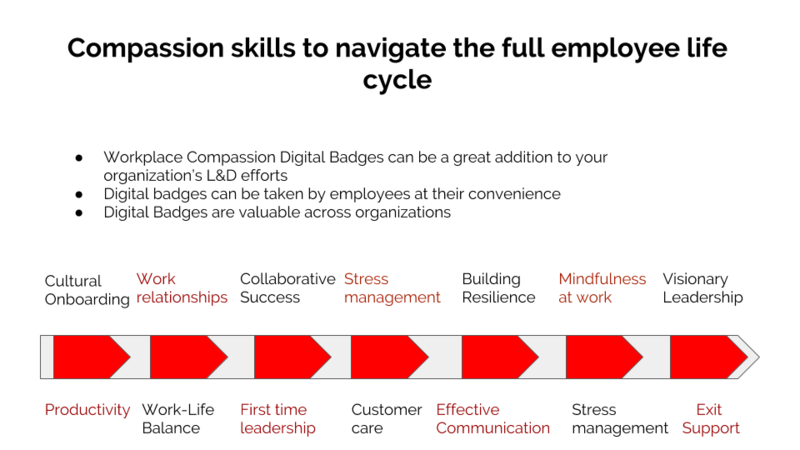 Training Compassion Ambassadors could be a cost effective and time-friendly way for large organizations to create a unified cultural narrative. Compassion learning can be part of the journey of your employee from the time you onboard them to the time they leave you. How would it benefit your organization to have employees that are connected by a umbrella culture of caring and excellence? Are you ready to take your company to excellence?